Having clean water is so important which is why we need to spread the word on saving water. Help bring awareness using our massive collection of slogans on water conservation. In Nairobi urban poor pay 10 times more for water than in New York. A person needs 20-50 liters (5.28-13.21 gallons) of water a day for basic needs. Water withdrawals are predicted to increase by 50 percent by 2025 in developing countries and 18 percent in developed countries. Water conservation, using water efficiently and avoiding waste, is essential to ensure that we have adequate water today and into the future. Water is a finite resource and the supplies on Earth today are no more than what was here at the beginning of the planet. It is up to all of us to use the water we have wisely, and it is as simple as each of us making small changes. Make conserving water a daily part of your life. And remember when you save water, you save energy and money! Having clean water is so important which is why we need to spread the word on saving water. 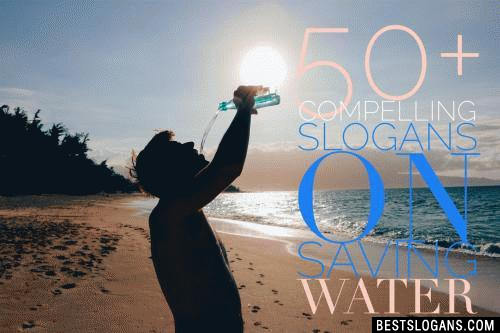 Help bring awareness using our massive collection of slogans on water conservation and deliver the message to people everywhere. 1 Water, Water everywhere, but we are dying for it. 2 Drink Water but don't waste Water. 3 Some places are completely lack of water, just save it. 4 Don't forget to save water, otherwise water will forget you a day. 5 Always revive in your mind that saving water can save a life. 6 Always remember to fill the glass up to the need. 7 Teach your kids to respect water so that they can have it later. 8 Every drop counts so let's start having fount. 9 Turn off taps while brushing can save water more than you think. 10 Never throw drinking water; always save to have it later. 11 Be sure of any leakage to avoid water seepage. 12 Use water only when you need as like costly things. 13 Start water conservation to prevent future dehydration. 14 Think of water conservation to prevent it from extinction. 15 Save water! Your small step can be the major change. 16 Be the real human being and save the water from your end. 17 Understand your responsibility of saving water so that you can be blessed with later. 18 Don't waste water to harvest it later. 19 Water is precious but its availability is serious. 20 If you don't know, ask the importance of water to a thirsty man. Can you think of a good Slogan On Save Water we're missing? Or come up with a clever one of your own. Please share below.